8 + 6 = ? : (Required) Please type in the correct answer to the math question. The weather today was the worst ever in the View. 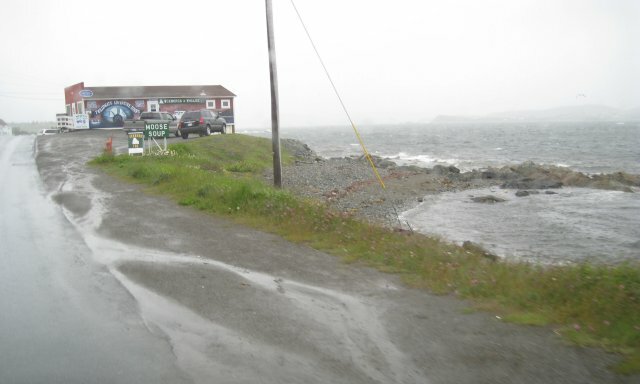 Rain, fog, high winds, and a temperature that started at 43 and is now 39 degrees F in Twillingate (twillin-gate) With the weather so poor, I couldn't face an extra 420 miles (round trip) of driving to St Anthony to see the authenticated place where the Vikings first landed in North America. Instead we just drove all day east 275 miles to Twillingate. We'll stay here two nights so we can see the folk band, Split Peas, perform tomorrow night at the Touton House. From the little we have seen so far, Twillingate is one of more prosperous towns in Newfoundland. All the others are very poor. It is also promoted as the Iceberg Capital of the World. I learned a new nautical term today "tickle". It's the channel between two islands. This whole part of Newfoundland used to be isolated fishing villages on islands. Causeways were built joining the larger islands so the area became much more accessible. The Shoal Tickle Bridge connects the north and south islands of Twillingate. Today's photo through the windshield captures the weather, the islands, and quaint buildings. If you enlarge the photo you can see the "Moose Soup" sign.